“Improving the equity of women, the treatment of women and girls, the value of women and girls in society is a very important means of improving population health,” says Dr. Anita Raj of the University of California, San Diego. Traditional societal expectations of women and girls in India contribute to high early marriage rates, low birth spacing, high rates of sexually transmitted infections, and high rates of abuse. Efforts to improve maternal and child health should take these and other gender inequities into consideration. “The need to work on these issues and work on them immediately cannot be overstated,” she said. 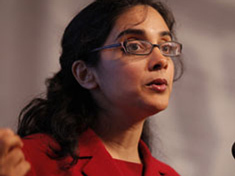 Raj spoke at the Wilson Center on April 18; download her slides to follow along.